Our 1-1/4 inch wide Rhinestone fabric dog collar has brilliant clear and colored crystals that are secured in jeweled filigree setting. This fabric dog collar tapers down at the buckle for easier buckling. 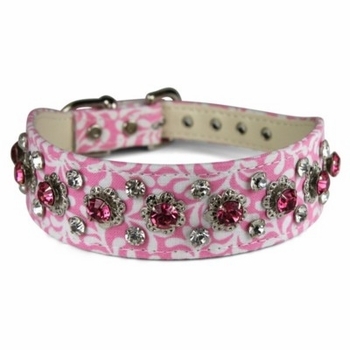 Our beautiful dog collars are available in Black, Pink, Red, Turquoise and in sizes 12, 14, 16 and 18. Size 12 will fit a dog with a 7-1/2 to 9-1/2 inch neck. Size 14 will fit a dog with a 9-1/2 to 11-1/2 inch neck. Size 16 will fit a dog with a 11-1/2 to 13-1/2 inch neck. Size 18 will fit a dog with a 13-1/2 to 15-1/2 inch neck. This dog collar is proudly handcrafted in the USA!